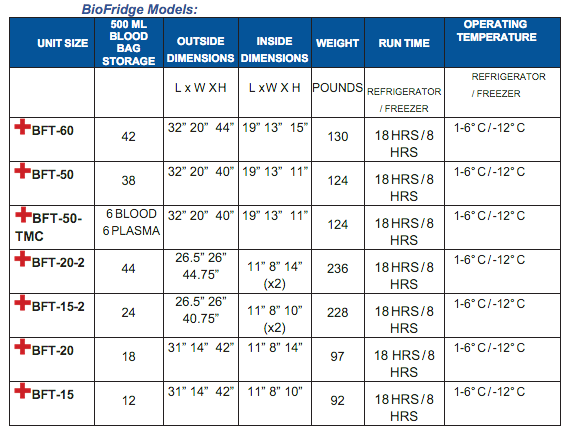 BioFridge is a self-powered portable refrigerator that makes transporting blood, vaccines, plasma and temperature-sensitive biological material safe and efficient. An internal fan to prevent thermal layering and keep temperatures uniform throughout storage space. Digital thermostat with local audible alarms for precise temperature control. Alarms if temperature falls outside range. Stainless steel hardware and lockable latch. TMC – Separate Compartments for Red Blood Cell and Plasma. Works seamlessly with our Sanguis Wireless Temperature Monitoring products for stationary or in-transit monitoring. By maintaining the appropriate temperature ranges there will be no guess work regarding the viability of product returned to the Blood Bank. Our Wireless Temperature Monitoring System shows real time status and documents continuous temperature control. As a result of maintaining temperature and having comprehensive automated documentation, thousands of dollars worth of product can be saved with confidence and peace of mind. The product is ideal for Massive Transfusion Protocol and moving large quantities of blood and plasma quickly and efficiently. The Wireless Temperature Monitoring System automates the recording of temperature data, significantly simplifying compliance. Operates for up to 18 hours on a single charge ensuring product temperatures stay in appropriate temperature ranges. The unique design of the Thermal Mass Carrier (TMC) quickly cools warm plasma from 37c to 4c within 40 minutes using separate internal compartments. The BioFridge is a significant part of a comprehensive and end-to-end blood management program. The BioFridge ca be loaded with Patient Specific blood, ensuring that the Patient receives the correct product. BioFridge works seamlessly with our Wireless Temperature monitoring Systems. Continuous Wireless Temperature Monitoring automates the recording of refrigerator and freezer temperatures eliminating manual temperature logs. If any device goes out of range the system will provide immediate notification to prevent product loss. All data and corrective actions are recorded to meet regulatory requirements. Our systems can also monitoring temperature and location during transit within and outside the facility.